Resistant weeds have a range of what are called fitness levels. In some cases, the resistance mechanism weakens the plant and it doesn’t grow quite as well as it once did. In other cases, the resistant plants are just as fit as their susceptible counterparts. Palmer amaranth in the United States is the world’s greatest example of glyphosate resistance with millions of acres infested. Our Australian Herbicide Resistance Initiative (AHRI) team has found — perhaps to no one’s surprise — that glyphosate-resistant Palmer amaranth is as fit as a fiddle. There is no evidence of the resistance mechanism weakening the plant in any way. Figure 1. 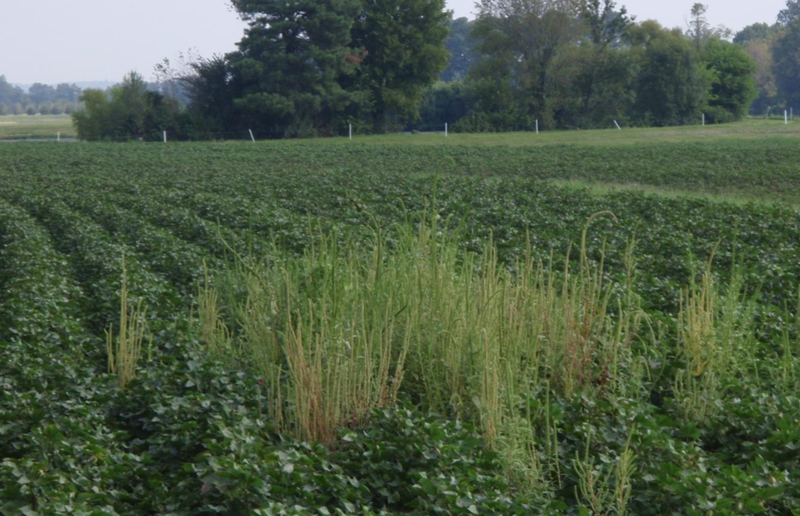 Glyphosate resistant Palmer amaranth in a soybean crop in Arkansas (photo courtesy Jason K Norsworthy). Two years later this entire field was covered in resistant Palmer amaranth. Palmer amaranth (pigweed) is a beast of a crop weed. It grows fast, is very competitive (as can be seen in the photo above) and can produce up to 1 million seeds per plant. There are millions of hectares of glyphosate resistant Palmer amaranth in the U.S. due to an over-reliance on glyphosate in glyphosate tolerant crops. Here in Australia, we thought that we had problems with ryegrass and wild radish. They pale by comparison. How does Palmer amaranth resist glyphosate? Glyphosate kills plants by inhibiting the EPSPS enzyme. The main resistance mechanism in Palmer amaranth is to over produce the EPSPS enzyme. The plant produces too much of this enzyme for the glyphosate to inhibit totally. Resistant plants have 5 to 160 extra copies of the EPSPS gene. Higher numbers of copies of the gene is directly correlated with larger amounts of EPSPS enzyme being produced. See past edition of AHRI insight. This study by AHRI researcher Martin Vila-Aiub, AHRI PhD student Goh Sou Sheng and others found that higher levels of gene amplification led to higher levels of glyphosate resistance. When glyphosate was sprayed onto Palmer amaranth at 200 gai /ha (450 mL/ha glyphosate 450) there was a range of Palmer amaranth survival depending on the number of copies of the EPSPS gene. Increasing the glyphosate rate to 2000 gai /ha (4.4 L/ha glyphosate 450) improved control of resistant Palmer amaranth. However, as the number of copies of the EPSPS gene increased, the survival of Palmer amaranth also increased. It would make sense that if the resistant plant must put energy into producing 5 to 160 times more EPSPS enzyme than normal, this extra energy consumption may weaken the plant and make it ‘less fit’ than susceptible plants. Unfortunately, this was not the case. In this study, Asst. Prof. Todd Gaines used PCR to measure the EPSPS gene copy number. Palmer amaranth plants with known gene copy number were then grown in pots with either 1, 4 or 8 plants per pot to determine how well the plants grew in competition with other Palmer amaranth plants. Plants with a fitness penalty have reduced ability to grow in competition with other plants. Without glyphosate but under competitive conditions, plants with up to 76 fold EPSPS gene amplification exhibited the same height and biomass compared to glyphosate susceptible plants. In this study both the vegetative and reproductive biomass were measured and both were unaffected. Palmer amaranth plants with more copies of the EPSPS gene produce more EPSPS enzyme. The higher the number of copies of the gene, the more resistant the Palmer amaranth is to glyphosate and this resistance mechanism comes at no fitness cost to the plant.